Over the years at Target Dashboard, we have received numerous requests for calculations and metrics to include in our scorecards, and we&apos;ve now added the option to create your own, custom scorecards using a wide range of metrics and fields. For example, you can now show Year-to-Date and a comparison to last year as well as your YTD target. Or you could create a more traditional scorecard that shows month-on-month trend, but excludes some of the fields that would appear in one of the standard designs and include others that wouldn&apos;t, like run rate. The custom scorecard option gives you the freedom to include the fields that you want to show in your scorecard, and exclude what you don’t need. 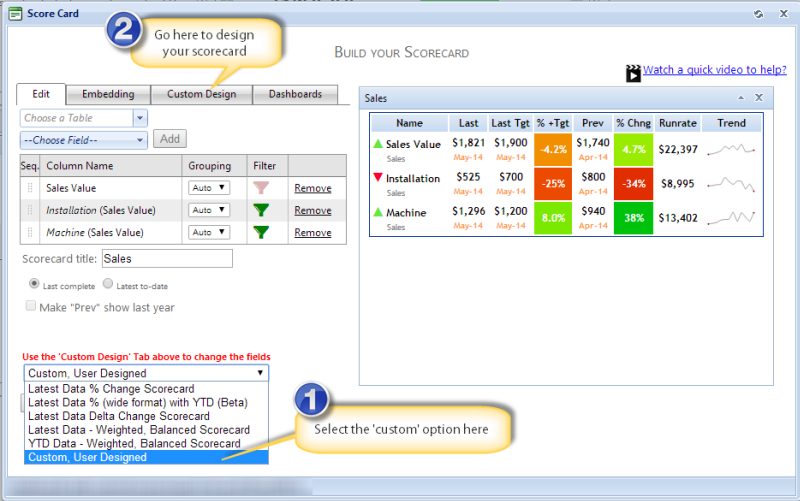 Below, you will find a description of all of the fields available to the custom scorecard. Please note that depending on the date grouping you are using ‘Month’ in the table below would equal Quarter, Week or Day. 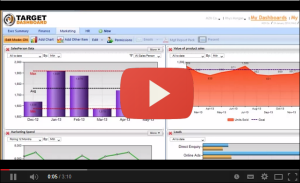 We’ve also created a short video on how to create a custom scorecard. Click below to watch it on YouTube! As usual, if you have any questions on the contents of this blog post, or anything else for that matter, just let us know on support@targetdashboard.com.